Since the sound is transmitted through the skull into inner ear rather than through the air, it as a matter of fact does feel a bit weird when you first try it. The way you perceive your own voice comparing to what others hear is a perfect example. The first time I heard my own voice coming out of a recorder really took me by surprise that I actually had such unpleasant voice. But we have to admit it that bone conduction does have some advantages over traditional earbuds. With bone conduction headphones your perceptions for outer world will not be blocked because bone conduction allows you to hear with your ears open to the surroundings. Moreover, bone conduction is also another opportunity for some of the hearing-impaired people. For these people they used to need to be surgically implanted a device to convert the through-the-air sound transmission to vibration. Now this process could be replaced by these commercial bone conduction devices on the market, without any risks that a surgery would possibly bring. Because the headphones utilize the bone conduction mechanisms of hearing, they are a great way for someone with a conductive hearing loss or single-sided deafness to enjoy audio streaming. They are also a good solution for those with any type of in-the-ear hearing aids. 【Ears free】 FREE YOUR EARS WITH THE SOUNDGLASSES WHILE INCREASING YOUR PERSONAL SAFETY AND MAKING YOUR LIFE A LOT EASIER! 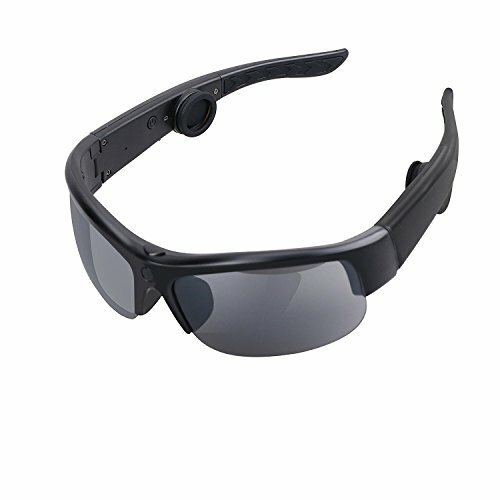 【Hands free】 Bluetooth links, easy to operate, can receive wireless calls on the glasses. A sound passed through directly to the auditory nerve bones, will not cause damage to the ear canal and eardrum, to maximize the protection of hearing. 【Safe Listening with Open-Ear】: The bone-conduction headphone tech with sunglasses transmits sound waves to the skull via vibrations. This let you hear external sound when listening to music, and therefore much safer than earphones or headphones which completely block out sound from outside. 【Replaceable Lenses】: PC 2.0 CAT 3 anti-scratch lenses that ensure an excellent shock protection. To serve various tastes and needs of customers, the bone conduction headphone sunglasses is designed to replace its lenses with 3 different colors that you can choose from(Fire, Black, Clear). You can change out the lenses for indoor/outdoor use. According to their own needs optional lenses in various environments are guaranteed to get the best vision protection.our default comes with plano lenses you can buy the suitable Myopic lens to exchange. If you have any questions about this product by ZAKOO, contact us by completing and submitting the form below. If you are looking for a specif part number, please include it with your message.